chili | Remains of L.A. 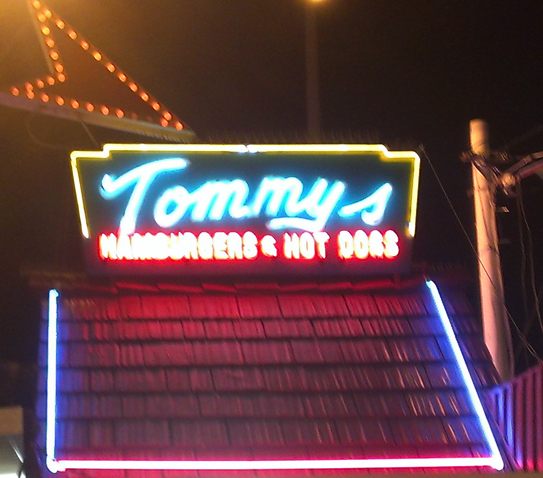 There are lots of Original Tommy’s Hamburgers stands around L.A., but this is the original one. I’ve never been to a Tommy’s, but David (my husband) is a fan so we stopped by late(ish) Saturday. The parking lot made a square, with two places to order and get food, one in the wall and one in the stand-alone shack near the street. The counter at the wall had a long line, with none at the shack, which was where I wanted to get the food anyway, so we walked over to find out why. The counter guy explained that they wouldn’t be opening for five or ten minutes. The line looked longer than that so we decided to wait. It was maybe three minutes, and by the time our food came there was a long line behind us. All the people made it feel like a party. Possibly because so many of them were at least a little drunk. Categories: Restaurants | Tags: 1946, chili, hamburger, Los Angeles, Restaurants, stand | Permalink.